I’m playing with fire. With two posts in a row about beets, I could forever lose any blog readers who are serious beet haters. But, wait. Even if you’ve disliked the flavor of beets in the past, you won’t really taste their earthiness here. They’re transformed into lovely ricotta gnocchi with parmigiano reggiano in the dough as well. And, they’re sauced with browned butter and crispy sage leaves, and topped with toasted walnuts. Of course, I have to mention that color. That pretty reddish-purple alone could help convince anyone to give these a try. I still have a little fear of making potato gnocchi although I did try it once, but ricotta gnocchi are somehow less daunting. The dough was mixed easily enough, divided into pieces that were rolled into ropes, and gnocchi were cut from the lengths. The recipe is from last April’s issue of Food and Wine magazine, and it’s available online. I’m always trying to bring beet haters around to fandom, and these gnocchi could finally do it. The beets need to be roasted and allowed to cool before they can be pureed for the dough. I did that step a day in advance. The skin slips right off the beets after they’ve been roasted. Then, I trimmed the ends, chopped them into big chunks and refrigerated them until the next day. 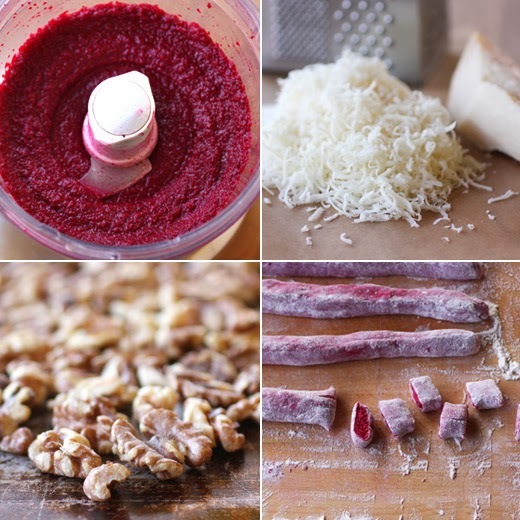 The beet chunks were pureed in a food processor until smooth. That puree was combined with ricotta, an egg, some salt, and grated parmigiano reggiano in a stand mixer. After mixing to combine, flour was added and incorporated. The dough was kneaded to smooth it a bit, and then it was wrapped in plastic and left to rest for about 30 minutes. The rested dough was divided into pieces that were each rolled into a rope. One half inch pieces were cut from the ropes of dough and placed on a parchment-lined baking sheet that had been dusted with flour. A second baking sheet was drizzled with oil, and water was brought to a boil in a wide pot. I only cooked enough gnocchi for one meal and placed the rest in the freezer. To cook them, they’re placed in boiling water but not too many at a time. There should be plenty of room for them to move around in the water. They’ll rise to the surface and then should be cooked for another minute or so. They’re then transferred with a slotted spoon to the oiled baking sheet. The oil is important because without it, they would stick. The last step is to brown some butter and crisp some sage leaves in it. Lemon juice was added to the butter and sage before the cooked gnocchi were tossed with the sauce. The dish was plated with toasted walnuts and more parmesan on top. The brown butter, sage, walnuts, and hint of lemon were perfectly matched with the gnocchi. I crisped some extra sage leaves because I always want more of them. I would definitely serve the extra gnocchi from the freezer in the exact same way again, but I might try adding some gorgonzola crumbles too. I also might try inviting some friends over who think they don’t like beets. Oh Lisa! You have outdone yourself with these gorgeous gnocchi. I'm a beet lover from way back so you will not lose me as a visitor. Even if I didn't like beets I would still visit. You create the most amazing meals!!! I can't even think of a better match than the Brown butter sage and the trimmings. Perfect! Thanks for sharing, Lisa...I would love to taste these right now!!! Beautiful, refined and ever so scrumptious! So gorgeous and flavourful! I am a huge fan of beets, so keep them coming! La mezcla es un maridaje perfecto me encanta luce muy bonito,abrazos. The most beautiful gnocchi I have seen! 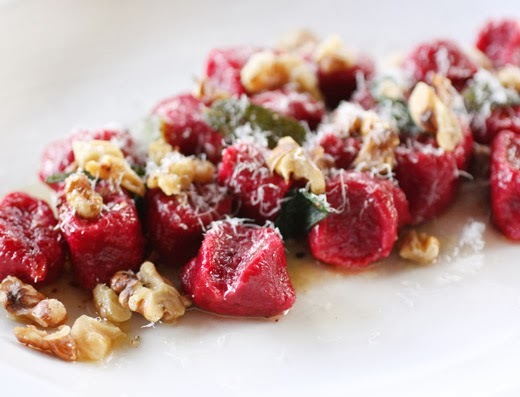 An exceptional beet recipe for a splendid winter treat! I don't love beets but I am always willing to try new recipes...especially when they are gnocchi!!! i've never even made regular gnocchi and here you are making a beet version! it's just gorgeous, lisa--impressive work! this is like a piece of art work! Love the vibrant colors of this gnocchi and the pairing sounds good too. 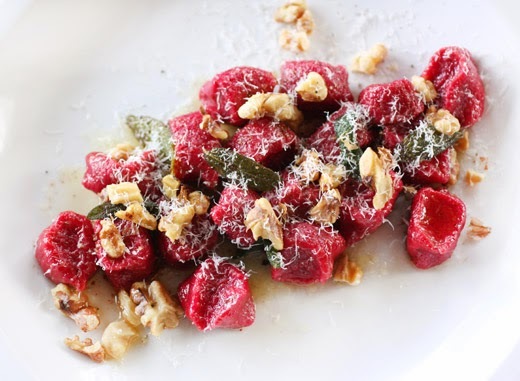 I tried making beet gnocchi once but somehow it fell apart and then I never gave it a try. I make gnocchi sometimes (not a lot, but sometimes), but never even thought to make beet gnocchi. Wonderful idea! I love this - thanks. Wow! I am not a beet lover but yowzers the color of these is stunning and would make me definitely eat a plateful. I am curious and intrigued! I think the texture of the gnocchi would make me forget the dislike of beets since it is really a question of texture. And the butter. Simply a gorgeous dish! I have two bunches of beets in my 'fridge, so beet recipes are great. The gnocchi looks gorgeous - and tasty too. Lisa, this is the most beautiful gnocchi that I have seen...I love the flavor of the sauce...absolutely gorgeous. I don't like beets at all but they make everything look so darn pretty and I might manage it in gnocchi. I understand that when you are referring to beet haters you're talking about me! These are so gorgeous though, I would definitely try them.